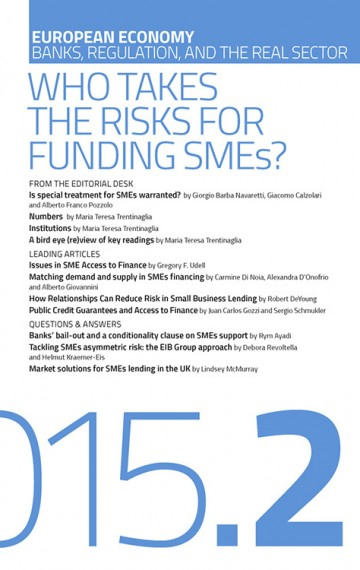 This essay summarizes the results from three recent research studies on small business lending in the U.S. Each of these studies provides evidence for considering the question “Who takes the risks for funding SMEs?” The risks associated with funding small businesses are borne by numerous factions in our societies, including but not limited to entrepreneurs, bank lenders, and taxpayers. The incidence of risk-bearing across these factions varies with the business cycle, with innovations in lending technologies, and with differences in social infrastructure. Overall, the level of risk is lower when bank-borrow relationships are stronger. Limited access to finance is still a major concern for many European SMEs, and tighter regulatory capital requirements, as well as the accumulation of non-performing loans, have strongly reduced banks’ capacity to extend new lending. This Q&A section discusses which measures are effective in improving banks’ risk taking capacity and in providing SMEs with alternative financial instrument. Also, this section provides a useful insight into the EIB Group activities in supporting SMEs access to finance.